Home › Books › Job Loss: What’s Next? 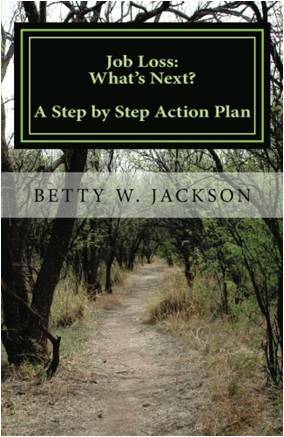 Available at Amazon.com in paperback and ebook formats or by order at www.bettyjackson.net. This book deals with the physical, psychological, sociological, financial, spiritual, and inter-relational aspects of job loss. It gives a step by step action plan for regeneration after the very real grieving process which occurs with job loss. Job Loss: What’s Next? should be part of every company’s severance package, and should be a gift to those struggling with job loss, or even anticipating such an event’s occurrence. Its practical Handbook section alone is reason to own it. It includes budget, timelines, priority lists, and checklists. Whether due to downsizing, layoffs, business failures, staff cuts, or retirement, JOB LOSS is traumatic. Not only is it painful to the person affected, it impacts his friendships, his families, his former coworkers, his community, and most certainly will change his life, perhaps permanently. In this economy, not a street in America has been immune to witnessing the immense tarnishing of the American Dream. This book takes the participant, victim, or those concerned about the unemployed worker, through an analysis of the grief process and personality traits, leading him/her through the reordering and reprioritizing stage, so that his/her self-image is preserved and repurposed for his next endeavors.